Like Doudou et Compagnie? Click here to view the entire range. 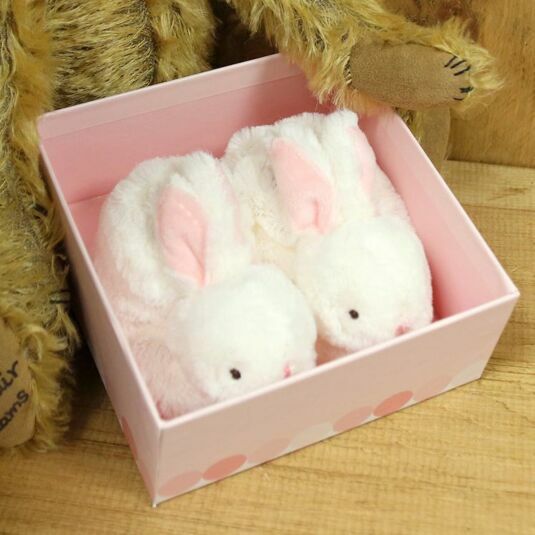 Your baby will love the soft touch of these luxurious bunny booties, with the added amusement of kicking their feet to hear the gentle rattle inside! Designed by French company Doudou et Compagnie, these bootees are absolutely adorable for any baby. The slippers are covered in a super soft fluff and an make a gentle rattling sound when baby wiggles their feet. The white fluffy rabbit shaped boots have contrasting pink colour fur at centre of their ears and a pink nose. A perfect gift for a newborn or a delightful Christening or Naming Ceremony gift! Doudou et Compagnie are known for their traditional French expertise and recognized worldwide for quality and innovation. Each creation is conceived and prototyped at the site of Taverny by talented designers and seamstresses.